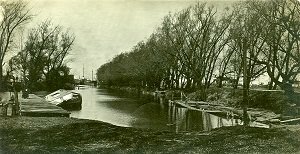 This week’s Throwback Thursday pic is of the Sandwich Canal. Taken in the early 1910s by Andrew Bowlby. This is part of an extensive photograph collection from the Bowlby family that is housed at the Community Archives located at the Windsor Public Library’s Central Branch. If you would like to view additional historic photographs of Windsor, please visit the library’s digital exhibit “Windsor’s, History and Pictures“.